Designed by Mirillis, Action! is an outstanding screen recording tool particular for your PC video games. Adopted advanced screen capturing technology, it is available to record any video and audio with high quality, such as streaming gameplay and webcam, video tutorial, etc. With user-friendly interface, it can bring gamers amazing using experience. Equipped with 4K video recording and Time-shift mode, Action! can output recording video with AVI and MP4, which at the same time supports live streaming together with screenshots. Making full use of your computer's GPU to accelerate game video capturing process, it can alleviate the pressure of CPU. Nevertheless, powerful as it is, there are some shortcomings need to be improved, for instance, letting users set frame rate manually, adjusting video bit rate accessibly, providing video editing feature. Considering these problems cannot be solved as soon as possible, gamers are looking for a more professional and full-featured alternative to Action!. Despite a wide variety of game recording software are developed in market, finding the best replacement of Action! to record gameplay is not easy enough. To keep balance between recording functions and pricing, we here will briefly introduce a simple-to-use and advanced game capturing program as the best alternative to Action! on recording games for you. Joyoshare Screen Recorder is a dedicated program that can be used to capture gameplay together with any other screen video activities with simple operation. 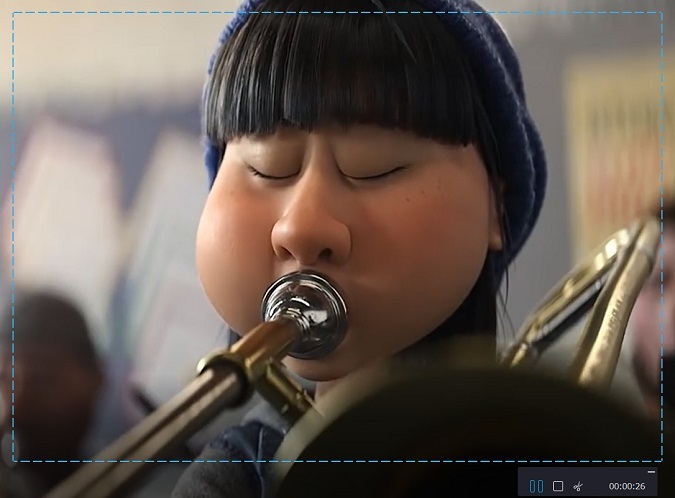 Being one of the most top-leading screen recording software, it offers the ability to capture not only videos but also audios that are shown on your desktop screen. 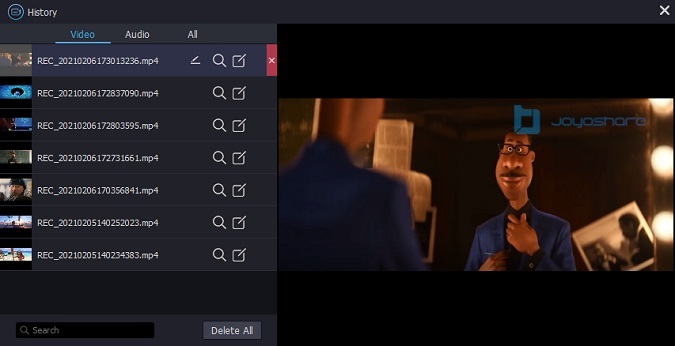 If you would like to enjoy excellent performance in a wonderful recording environment, then Joyoshare Screen Recorder is a program that well designed to capture game videos, record any area on your screen, make vivid video tutorials, help you to keep Skype calls, capture streaming music, etc. 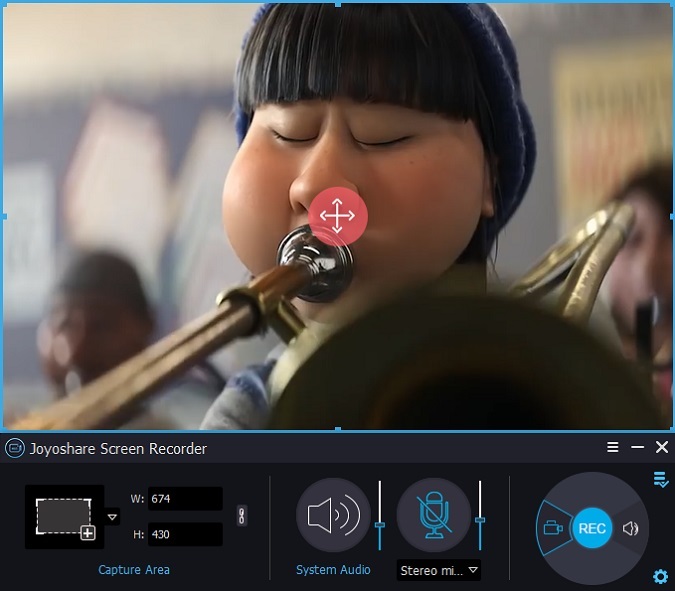 Being good at working as both video recorder and audio capture, Joyoshare Screen Recorder can be utilized to capture game video and audio track at the same time. Regarded as an advanced capturing tool, it includes full support for any popular devices, such as Andriod, iPhone, Xbox and smart TVs. 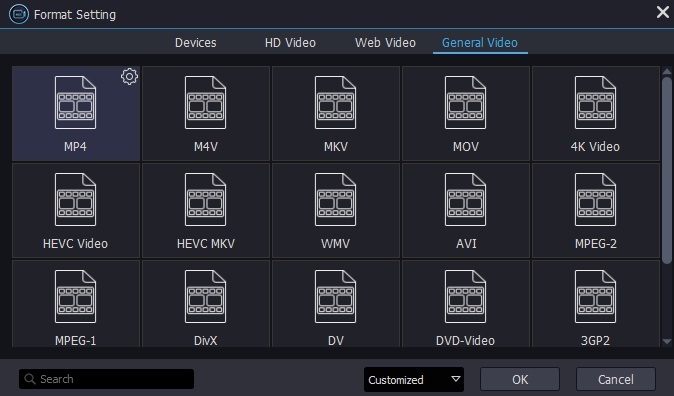 Diverse output format like M4V, MKV, MOV, HD MP4, WMV, AVI and more other formats are available to assist you. Of course, there are typical output formats for audio recording, like MP3, AAC, WAV, FLAC, M4A and M4B. Essentially, Joyoshare Screen Recorder can provide you all-in-one solutions, which allows you to customize capturing area, choose output format, take screenshots anytime, preset a scheduled recording task, trim game video, highlight clicks, make full use of shortcuts, etc. Furthermore, you are entitled to close system sound to avoid unexpected intervention. Generally speaking, all options are decided based on your own preference. How to capture gameplay with Joyoshare Screen Recorder? Download Joyoshare Screen Recorder to your PC and go straight to run it on your desktop. Then the following window will in your sight. It is easy to see a "+" button layout in "Capture Area" section on the top left corner. To choose a recording area, you can feel free to click it and then zoom in or zoom out the adjustable window. Joyoshare Screen Recorder is capable of deciding which screen area is selected to capture by yourself so that you can customize a specific number or directly choose full screen. Besides, there are provided standard ratios, like 320x240, 640x480, 1280x720, etc. To capture game video, Joyoshare Screen Recorder can be used to record both game video and audio simultaneously. You are allowed to capture either both of them or one of them on the basis of your requirement. More importantly, it is accessible to determine whether record with or without system audio and microphone sound, aiming at removing unwanted noise in case that you are unwilling to evolve it in your gameplay recording. Note: If you prefer to use Joyoshare Screen Recorder as an independent audio capture, you can click the audio track icon on the right hand of the red button "REC" to take advantage of this audio function only. 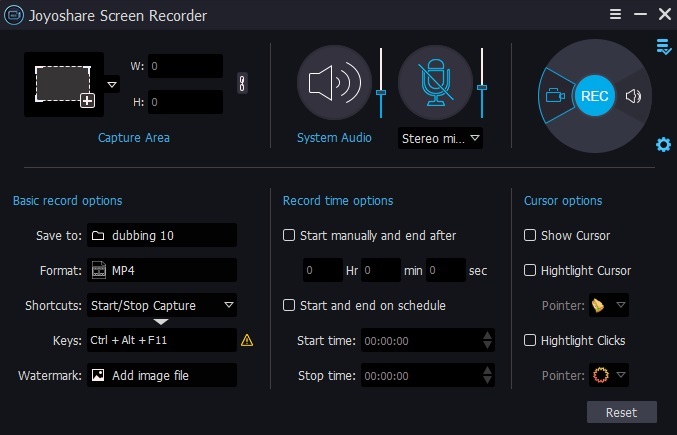 Joyoshare Screen Recorder offers the ability to choose a popular output format, make use of shortcuts, preset a scheduled recording task in advance by setting a definite start time and stop time, add effects to cursor or click, etc. Note: You have chance to output your game video capturing as MP4, M4V, AVI, MOV, FLV, WMV, SWF, etc, and save it to multiple popular devices, like iPhone, Xbox, smart TVs and so on. Open a game program or enter an online game website which you want to record from. Simply click the red "REC" button to start to record a game video. It can be used to slit your video into several segments and take screenshots at any time. Enter "History" interface and click one game file to edit. You can manage it by revising its file name and correcting its ID3 tags flexibly. If you have no idea whether Joyoshare Screen Recorder is suitable for you, you can try its free trial version in advance.